Happy Monday! Y'all may remember this post where I told y'all I was teaming up with The Mailbox Company to share with y'all the fabulous features of their new Mailbox Gold tool. 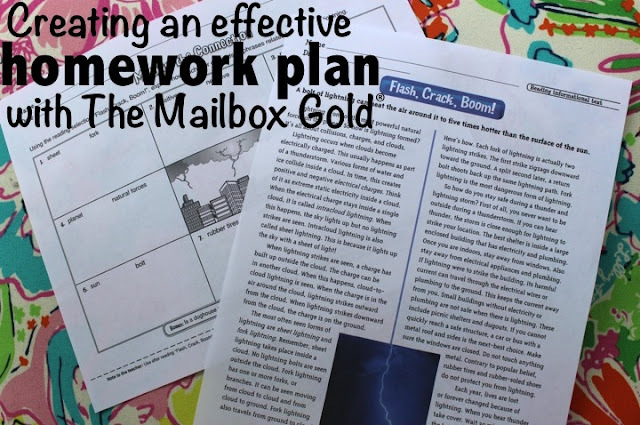 Today I want to share how I use that to create an effective homework plan for 5th grade. I LOVE the passages with questions and activities. This would be a perfect homework assignment after close reading the passage together in class. Reading is SO important to do at home each night! If I asked every 5th grader if they read at home, their response would be "Of course!" :) They need a little responsibility to make sure they are doing that, so I like to send home a record that they are responsible for filling out. And this isn't homework, but since independent reading is SO important in 5th grade (and every grade!) I sometimes like to require a reflective reading response to make sure they are actually reading. These printables are fabulous! I love this. I have a mailbox gold subscription. I use it alot. I'm thinking of pulling a passage and creating a foldable to go with it to do nightly homework in. That is a great idea!! I might have to steal it! :) Isn't the Gold tool great?! I've never heard of Mailbox Gold! Thanks for the suggestion!